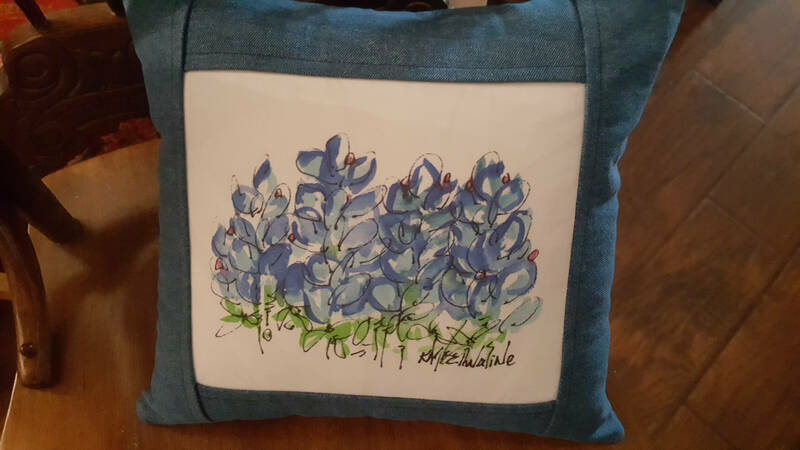 Novelty decorative reversible denim pillow featuring hand painted Texas bluebonnets art fabric block produced by Texas Hill Country artist Kathleen McElwaine. Kathleen is known for her original whimsical watercolors featuring familiar Texas motifs. The front of the pillow is composed of blue denim and hand painted Kona cotton. 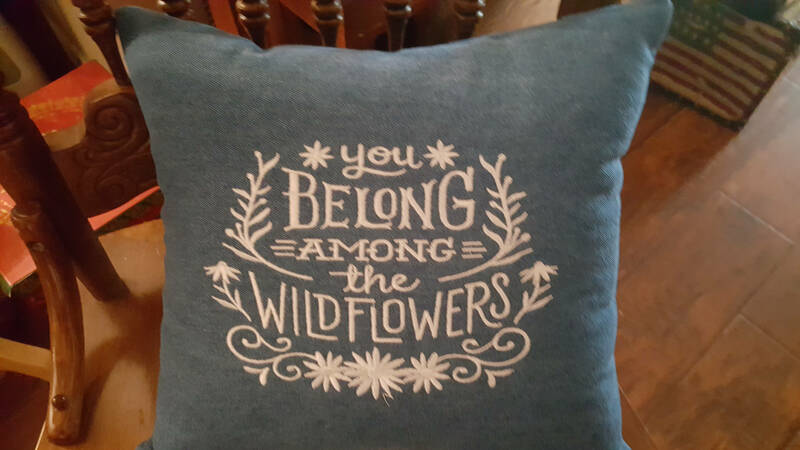 The reverse side of the pillow is embroidered on blue denim with the "You Belong Among the Wildflowers" design by Urban Threads. The pillow measures approximately 16 inches by 16 inches and includes a zipper closing located at the bottom of the pillow for removal of pillow form for ease of cleaning. Pillow form consists of polyester fiber. Special Touch Embroidery suggests spot cleaning of item with a mild detergent and air drying to protect hand painted design and embroidery. Since all of our products are made to order, please allow 7 to 10 days prior to shipping. All of our products are sent USPS Priority Mail unless otherwise specified by shop or requested by buyer. We are committed to providing you with the highest level of customer satisfaction possible. If for any reason you have questions or concerns, we are delighted to hear from you. Email us at cawalker [!at] msn.com or by Etsy notes or conversation to seller. You can expect us to respond to your email or message within 24 hours.